Millions of years of genetic mutation and adaptation have produced a singular animal whose body, mind, and spirit are primed to sprint as if life depended on it. That animal is you. So why are you just standing there? During his first full-throttle “persistence hunt,” the South African biologist Louis Liebenberg was working with bushmen in the Kalahari Desert in the early 1990s. Armed with handmade bows and arrows, the hunters had been stalking kudu — a nimble antelope, slightly smaller than an elk. When a young stag split off from the herd, the bushmen ran flat-out after it. The kudu moved quickly out of sight in the brushy Kalahari landscape. But keeping up was more than just a matter of running; the hunters also needed to pick up footprints in the sand on the fly. Liebenberg, then age 30, hadn’t done the conditioning to be a long-distance runner, and he was wearing heavy leather boots as a precaution against poisonous snakes. And this was shaping up to be a hard run. In persistence hunting, the trick is to trot almost nonstop in the heat of the midday sun, pushing the animal along so that it never has time to recover in the shade of an acacia tree. The Kalahari hunters have figured out how to play one critical advantage in a deadly game that pitches their survival against that of animals: Humans have an evaporative cooling system, in the form of sweat; antelope don’t. When conditions are right, a man can run even the fastest antelope on earth to death by overheating. But after 10 or 12 miles, Liebenberg was overheating, too, and by the time he reached the kill, he was so dehydrated he’d stopped sweating. The only liquid in sight was the stomach water of the dead animal, but his companions stopped him from drinking it, because kudu eat a leaf that’s toxic to humans. If one of the hunters hadn’t run back to camp for water, Liebenberg figures he would have died. He also figures the experience taught him the answer to an ancient question. Why do 11 percent of Americans and tens of millions of people around the world tie on running shoes and clock their weekly miles? The three most recent presidents of the United States have put in time as runners (and earlier this year, one candidate, Mike Huckabee, trained for the Boston Marathon while campaigning for the U.S. presidency). The president of France, Nicolas Sarkozy, is a runner. And beyond the vast army of ordinary joggers, it can sometimes seem as if the entire planet is trembling beneath the footfalls of ultramarathoners, Ironmen, and other endurance athletes. Runners also make the news by dying while running–two died in the 2006 Los Angeles Marathon, another during unseasonably hot weather at October 2007’s Chicago Marathon, and yet another a month later, when 28-year-old Ryan Shay died of heart failure during the Olympic Marathon trials. So the question is asked not just in puzzlement but sometimes in anger and sorrow: What makes us run? Daniel Lieberman, Ph.D., first started to think about whether humans evolved for running as he was running a pig on a treadmill. A colleague, the University of Utah biologist Dennis Bramble, happened to look in. “That pig can’t keep its head still,” he remarked. This was an observation Lieberman admits he never made in months of running pigs. Bramble invited him next door, where a dog running on a treadmill was holding its head “like a missile.” The conversation turned to the nuchal ligament, a sort of shock cord stretching from the back of the skull down the neck. It keeps the head from pitching back and forth during a run. Dogs have one because they’ve evolved for running. Pigs don’t. Lieberman and Bramble were soon digging through bone collections. The skulls of chimpanzees, our closest primate relatives, showed no evidence of a nuchal ligament. But skulls of the genus Homo, which includes modern humans, did. “We had one of those epiphany moments that happen occasionally in science,” says Lieberman. Much as chimps were built for life in the treetops, the two scientists began to ask if humans were built for life on the run. Almost 20 years later, I’m the pig on Lieberman’s treadmill. A postdoctoral fellow, Katherine Whitcome, has me trussed around my hips, chest, neck, and forehead with gyroscopes and accelerometers for measuring angles and speed of movement. The insoles of my running shoes have been fitted with inserts laced with devices that will measure my heel strikes and the way I roll off my fifth metatarsal. Wires run through a duct-tape collar to an assortment of electronic boxes on a nearby shelf and from there to Whitcome’s computer. Lieberman starts the treadmill. “Pretend that the piece of yellow paper on the wall is your antelope,” he says. The speed kicks up to 6.7 miles per hour, and as my stride lengthens to keep pace, a dismal, office-worker thought passes through my mind: I salivate for Post-it pads. I have never been a hunter. But as a journalist, I have been in on chases after real animals and close enough to witness a kill. Once I was following a fox hunt on foot through hilly country in Ireland’s County Meath. The riders came thumping down a muddy lane, shaking the earth with the staccato of metal horseshoes clattering on the occasional rock. They paused as the hounds searched a stand of woods. Flocks of blackbirds fled in alarm from the bare treetops. Then a hound let out the first strangled cry as he caught a hot scent, and a moment later a fox made a beeline out of the woods and up a hill. After a moment of confusion, the hounds also burst into the open. The horses took off. I followed, leaping from hummock to hummock to traverse a wet section and then sprinting up a slope, feeling as fleet and sure-footed as the 9-year-old who was running beside me. On another hunt, I saw the hounds chase a fox into a wetland, cascades of water kicking up around their feet. Then the distance closed and the fox vanished in a bloody cloudburst. I suppose I should have felt remorse. But what I honestly felt was exhilaration at the close connection to the hunt, with life and death in the balance. The sudden power of forgotten urges astonished me. Had they been my kills, I would have smeared my face ritualistically with the blood. Anyone who has put in some miles knows how good running can feel, once it stops feeling bad. But beyond the way it feels, medical evidence also suggests that humans are built for endurance exercise. In response to a good training program, for instance, the left ventricular chamber of the heart can increase as much as 20 percent in volume. The chamber walls thicken, too. So the heart fills up faster and pumps more blood to the rest of the body. The coronary arteries also change, dilating more rapidly to meet the body’s demand for oxygen. Endurance exercise won’t make anyone live forever. But it seems to make the cardiovascular system function the way the owner’s manual intended. In the skeletal muscles, increased blood pressure causes new capillaries to emerge. The mitochondrial engines of the cells ramp up to consume energy more efficiently, helped along by an increase in the production of various antioxidants. These changes in the heart and extremities together typically boost the maximum amount of oxygen the body can consume each minute by 10 to 20 percent. For men who used to become short of breath slouching to the fridge for a beer, VO2 max can increase even more. Lapdogs start to function like wolves. More surprisingly, the brain responds as if it was built for endurance exercise, too. Everybody knows about the runner’s high, that feeling of euphoria thought to be triggered by a rush of endorphins to the reward centers of the brain, usually near the end of a good, long workout. (Running for dinner, as part of a hunt, could very well amplify that effect; in essence, a love of running could lead to more ample dining opportunities.) But researchers have discovered lately that exercise affects the function of 33 different genes in the hippocampus, which plays a key role in mood, memory, and learning. By stimulating growth factors, exercise also produces new brain cells, new and enhanced connections between existing cells, new blood vessels for energy supply, and increased production of enzymes for putting glucose and other nutrients to work. People who exercise regularly perform better on some cognitive tests: Run more, think better, hunt smarter, eat better. Exercise also seems to buffer the brain against neurological damage, reducing the effects of stress and delaying the onset of Alzheimer’s and other diseases. Most significant, exercise helps prevent and alleviate depression, which afflicts one in six Americans and costs $83 billion a year. In fact, studies suggest that exercise works as well as pharmaceutical antidepressants, and that the effect is “dose dependent”–that is, the more you exercise, the better you feel. To put it in the less romantic language of anatomy, it’s the reason we are sweaty, hairless, elongated, and upright. It’s also the reason, Lieberman and Bramble say, for the exaggerated size of the human gluteus maximus. Their studies show that our big buttocks don’t matter much in walking on level ground, but they are essential for staying upright when we run. Our legs have evolved for running, too, says Lieberman, and not merely in length. “Human legs are filled with tendons. Other scientists have begun to incorporate the “endurance-running hypothesis” into their research. Timothy Noakes, M.D., a South African physician whose book The Lore of Running is the bible of technical running, argues that misunderstanding human evolution can pose a deadly hazard to endurance athletes. British and American runners in particular have fallen prey to the notion that it’s essential to stay heavily hydrated during a race. Runners have died of hyponatremia brought on by drinking too much liquid while sweating profusely, which diluted their blood sodium to a lethal level. But other researchers have attacked the endurance-running hypothesis, mainly on cultural grounds. Writing last year in the Journal of Human Evolution, Travis Pickering and Henry Bunn, anthropologists at the University of Wisconsin, argued that persistence hunting was too rare to have played a large role in our evolution. Bunn also calls endurance-running proponents “incredibly naive” in failing to consider alternate explanations of how early humans secured meat. They may have banded together as “power scavengers,” for instance, to steal kills from ambush predators. In any case, he says, meat was a relatively minor, though coveted, part of their diet. So if humans evolved for distance running, does that mean we should all be out notching up marathons now? Even ardent runners generally don’t think so. On a winter afternoon, Walter DeNino, a medical student at the University of Vermont, is doing his regular training run along the Lake Champlain shoreline. Back in high school, he says, he logged so many miles that he ended up on crutches at the age of 15, with multiple stress fractures. He started to think that maybe some people really aren’t built for long-distance running after all, or at least not for the distances we’re tempted to run by the addictive nature of the sport. Eventually, DeNino took up the triathlon, with a training emphasis on swimming and cycling. He also founded a coaching and sports-nutrition company, Trismarter.com, which aims, among other things, to lure lapdogs and couch potatoes back to the active life. The triathlon is a much newer sport than the marathon, he says, and it’s more welcoming to different body types. That seems to be how nature works, too. Heinrich points out that humans have hunted with weapons long enough for natural selection to favor survival talents other than running. The rise of agriculture also may have changed the shape of the human animal. So some people have the light, lean, almost birdlike build of the ideal long-distance runner, and others are built squat and strong, for moving earth. According to one line of research, the cultures of our ancestors may even give some people a genetic predisposition to or away from long-distance running. And yet as I ran on the treadmill that day in Lieberman’s Harvard laboratory, it seemed to me that the proponents of endurance running were onto something persuasive and appealing about human nature. There were moments when I forgot about the Post-it-pad antelope. Instead, I imagined a real antelope racing out ahead of me. I imagined my distant ancestors on the African savanna, hunting not quite beside me, but somewhere within. And just the thought of that connection lifted me out of this mundane world and away to someplace wild and even a little sacred. This entry was posted in 4.1 Persistence Hunting, 4.2 Endurance Running and tagged 4.2 Endurance Running, Bernd Heinrich, Born to Run, Bushmen, Dan Lieberman, Kalahari Desert, Louis Liebenberg, persistence hunting, Tim Noakes, Why we run on 2014/02/05 by Louis Liebenberg. Probably over 2 million years old and likely the most ancient form of hunting (before the domestication of dogs and the invention of weapons), persistence hunting is/was done without weapons. This was mainly possible because of the unique human physical ability to outrun an animal to exhaustion. Strange as it sounds humans are the best adapted creatures on earth to run long distances in hot conditions. Because unlike most animals our upright bodies aren’t so close to the hot ground, we sweat to cool down, don’t need to drink as frequently as other animals and our breathing is independent from our stride. But besides endurance running, another important factor contributing to our persistence hunting success was our unique ability for scientific thinking. Humans had to be able to deduce, predict and theorize where the prey might be or run to (more on this in the videos to follow). Back in the early 1980′s, 22 year old Louis Liebenberg was majoring in Maths and Physics at Cape Town University. There he had begun challenging the traditional view that the human brain could not be the product of natural selection because of it’s appreciation for art and science (which meant that it far exceeded the capacity of all other animals). However Louis had a hunch that scientific thinking was indeed evolutionary and had developed as a necessity for the survival of modern hunter-gatherer societies, especially from the practice of animal tracking in hunting. So on deciding he would rather research his evolutionary intuition than finish his studies, to prove his evolution theory Louis dropped out of college. This entry was posted in 4.1 Persistence Hunting, 4.2 Endurance Running and tagged 3.1 Scientific Reasoning, 4 The Art of Tracking, 4.2 Endurance Running, Born to Run, Bushmen, CyberTracker, Environmental awareness, Louis Liebenberg, persistence hunting, Scientific thinking on 2014/01/17 by Louis Liebenberg. Lone Tree, Central Kalahari, August 29, 1990. We had been hunting for two weeks with no luck. It was at the end of the dry season and the dry grass made it difficult to stalk close enough to animals to get a good shot with a bow and arrow. That morning we were tracking a healthy kudu bull. By midday we caught up with it, but again it ran away. This was when !Nate (photo), Kayate and Boroh//xao decided to run it down. It was an extremely hot day and conditions were ideal for persistence hunting. !Nam!kabe, who was too old to run far, went back to our camp with all our unnecessary weight – bows and arrows, digging sticks, clubs and my camera equipment. They told me to go back with !Nam!kabe, because no white man can run down a kudu in such heat. But I insisted that I had to run with them so that I can see how they do it. So we drank our fill, emptying the water bottles before setting off at a stiff pace. Even at the outset my boots felt heavy and I found it difficult to keep up the pace in the sandy terrain. At times they would run away from me, but when they lost the spoor and were delayed in looking for the spoor I managed to catch up with them. At times they would fan out, each hunter making a prediction of where he thought the kudu was heading, so that if the kudu followed a curved path, one of them would gain an advantage by taking a short cut. The others would then cut back to catch up with the one who picked up the spoor. Boroh//xao was the first to drop out and start walking. I managed to keep up with !Nate while Kayate had increased his pace and was pulling away from us. When we got to some thick bush, however, I lost sight of !Nate who was about a hundred meters ahead of me. The terrain was difficult in places and several times I lost the trail. In the process Boroh//xao had caught up with me again, and since I was quite exhausted by that time, decided to follow the trail with him at a fast walking pace. As we followed the tracks I could visualise the whole event unfolding in front of me. The kudu started to show signs of hyperthermia. It was kicking up sand and its stride was getting shorter. As it ran from shade to shade, the distances between its resting periods became shorter and shorter. In visualising the kudu I projected myself into its situation. Concentrating on the spoor I was so caught up in the event that I was completely unaware of my own state of exhaustion. As if in an almost trance-like state I could not only see how the kudu was leaping from one set of tracks to the next, but in my body I could actually feel how the kudu was moving. In a sense it felt as if I myself actually became the kudu, as if I myself was leaping from one set of tracks to the next. Every time Kayate and !Nate caught up with it, it would run away, leaving them behind. But while it accelerated from its resting position and stop to rest again, the hunters were running at a constant pace. The distinctively human sweating apparatus and relative hairlessness give the hunters an advantage by keeping their bodies cool in the midday heat. But in the process they risk becoming dehydrated. The hunters therefore have to know their bodies and measure their own condition against that of the kudu. If they run too fast, they will exhaust themselves or overheat, but if they do not run fast enough, they will never exhaust or overheat the kudu. They must run fast enough not to allow the kudu too much time to rest, which is when the kudu cools down, restoring core body temperature. We could see from the spoor that Kayate had dropped out and that only !Nate was chasing it. Boroh//xao pointed to the moon and said that the kudu will get away, because the moon was out in daylight. But by this time the kudu seemed to be so exhausted that I insisted that we should carry on. At one point a cold shiver went through my whole body and for the first time I realised that I was dragging my feet in the sand. Some times my legs buckled under me and I would stumble over branches, but through intense concentration on the spoor it was as if though my mind was simply dragging my body along. !Nate had picked up his pace and was closing in on the kudu. With the kudu showing signs of severe exhaustion or overheating, !Nate broke into a sprint, running in front of the kudu and keeping it from getting into the shade. At the same time he tried to cut in front of it to chase it back to Kayate. When we finally caught up with !Nate and Kayate, they were on their way back to the camp. When I asked !Nate where the kudu was, he told me that it got away. When he saw the disappointment on my face he laughed at me, telling me that the kudu was not very far. I asked if I could drink the stomach water of the kudu to quench my thirst. I had drunk the stomach water of gemsbok on a previous hunt, and although it tasted like rotting grass soup, it was not too bad. At this stage I was so thirsty that taste was not much of a concern. But !Nate said that I would die if I drank it, because the kudu was feeding on a leaf that is poisonous to humans. As we started to walk back to our camp, my mind relaxed and I was suddenly overcome by a sense of total exhaustion. My legs were weak and shaky and my mouth was dry. I asked !Nate if there were any succulent roots I could dig up, but he replied that it did not rain in that part of the Kalahari for a long time and that there were no water. Half way back to the camp I realised that my armpits were bone dry. I had stopped sweating – the first symptoms of heat stroke. As the implications of my situation dawned upon me, I experienced an overwhelming sinking sensation – as if the vast dry Kalahari was like an endless ocean and I was sinking down deeper and deeper. I found myself in a desperate situation. I had to get into the shade to cool down my body, but at the same time I had to get water as soon as possible. If I dehydrated any further and my body overheated because I no longer produced sweat to cool down, I could die very rapidly. !Nate, who had been watching me closely, realised that I was in serious trouble. He told me that he will run back to our camp and ask !Nam!kabe to bring me water. After resting in the shade for a while, Kayate urged me to walk further, because the camp was still very far and the sun was going down. Once it got dark, !Nam!kabe will not be able to follow !Nate’s tracks back to find us. Walking very slowly, I experienced the ultimate sense of helplessness. My life depended totally on !Nate. If I tried to walk too fast I could kill myself, yet I had to try and make as much progress as possible because if I did not get water soon I could also die. Every now and then I would rest in the shade, and after a while Kayate would urge me on again. After what seemed to be an eternity the sight of !Nam!kabe carrying several water bottles created an incredible sense of relief. But I still had a long way to go. !Nam!kabe explained that I must not drink a lot of water, because if I drank too much water too quickly I could die. I first had to wash my face and wet my hair to cool down my head. When you suffer from heat stroke you will die if your brain overheats. Only after cooling my head could I take small sips of water, slowly taking in water over an extended period of time. Later !Nate told me that he also stopped sweating by the time he reached the camp. When he chased the kudu, after everyone else had dropped out, his timing was so fine that had he chased the kudu just a short distance further, he could have killed himself. He risked his own life to save my life. It took a while for the significance of this single event to sink in. Apart from the fact that I almost lost my life in the process, my spontaneous spur-of-the-moment decision to run with them resulted in something quite unique. 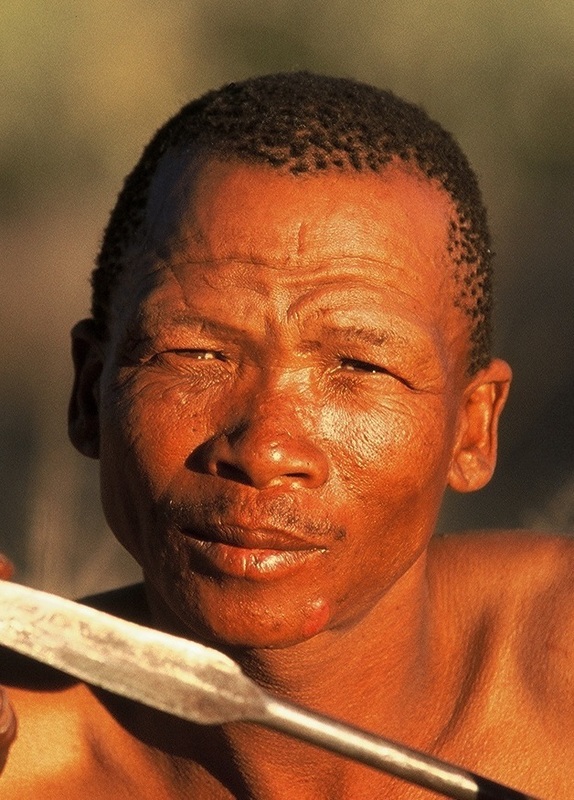 For more than fifty years, the Kalahari Bushmen were amongst the most intensively studied population group. Yet, as far as we know, not a single anthropologist had witnessed the persistence hunt. There have been several anecdotal accounts of persistence hunting, but no one (apart from the Bushmen themselves) had actually witnessed it. One reason may be that, unlike the bow-and-arrow which draws attention to itself, the persistence hunt requires no weapons. There is therefore no specific weapon or artifact that would prompt an anthropologist to ask hunters about it – and no direct evidence of it in the archaeological record. Unless you already knew about it, it would not occur to you that you should ask hunters about it. 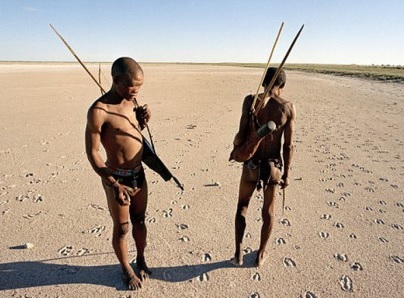 /Ui /Ukxa of //Auru village was a young hunter when the Marshall family first arrived in the 1950’s at Nyae Nyae in Namibia. I asked him if anybody have ever asked him about the persistence hunt. He replied: “No, people only asked me about the bow and arrow.” Since nobody asked them, hunters simply never told anthropologists about it. Persistence hunting was probably one of the first forms of human hunting, yet a tradition that lasted perhaps as long as two million years was only witnessed in the very last decade before it died out. In this book I will show that persistence hunting may have played a critical role in the origin of science. In 2001 I worked with the BBC to film Karoha Langwane running the persistence hunt for The Life of Mammals, presented by David Attenborough. This entry was posted in 4.1 Persistence Hunting and tagged Bushmen, Kalahari, Kudu chase, Louis Liebenberg, persistence hunting, tracking on 2014/01/06 by Louis Liebenberg. CyberTracker has grown from a simple hypothesis: The art of tracking may have been the origin of science. Science may have evolved more than a hundred thousand years ago with the evolution of modern hunter-gatherers. Scientific reasoning may therefore be an innate ability of the human mind. This may have far-reaching implications for indigenous knowledge, citizen science and self-education. In 1990 I ran the persistence hunt with !Nate at Lone Tree in the Kalahari. The persistence hunt involves running down an antelope in the mid-day heat on an extremely hot day – chasing the antelope until it drops from heat exhaustion. This may well be one of the oldest forms of hunting, going back two million years ago, long before humans invented bows and arrows. Persistence hunting may have played a critical role in the evolution of the art of tracking and the origin of science. After running the persistence hunt in 1990 !Nate asked me to help them. They could no longer live as hunter-gathers and needed jobs. Wildlife in the Kalahari has been decimated by fences that cut off migration routes. It was no longer viable to live as hunter-gatherers. And the art of tracking was dying out. After hundreds of thousands of years, traditional tracking skills may soon be lost. Yet tracking can be developed into a new science with far-reaching implications for nature conservation. We had lengthy discussions around the fire, and it was decided that I should try to find a way to create jobs for trackers. Only by developing tracking into a modern profession, will tracking itself survive into the future. !Nam!kabe agreed that this will be good for the future. But he also had the wisdom to know that it will take a long time. This was for the younger generation, he said, it will not be for him. When he died in 1995 his exceptional tracking expertise was irretrievably lost. He was one of the last of the old generation hunters and one of the best trackers. !Nam!kabe inspired the creation of the Master Tracker certificate – the highest standard of tracking that others could aspire to. The Tracker Evaluation methodology that I developed provide certification of practical tracking skills, thereby enabling trackers to get jobs in ecotourism, as rangers in anti-poaching units, in wildlife monitoring and scientific research. Tracker evaluations have since 1994 resulted in a steady growth of trackers with increasing levels of tracking skills, thereby reviving tracking as a modern profession. The Tracker Institute was established as a centre of learning for the highest standards of excellence in the art of tracking and to develop the next generation of Master Trackers. The Tracker Institute is situated in the Thornybush Nature Reserve, providing the opportunity to track lion, leopard, rhino and a wide diversity of species. In addition to providing intensive individual mentoring of practical tracking skills, it will also serve as a research institute. If the art of tracking was the origin of science, then modern-day trackers should be able to do science. However, some of the best traditional trackers in Africa cannot read or write. To overcome this problem, the CyberTracker software was developed with an icon-based user interface that enabled expert non-literate trackers to record complex geo-referenced observations on animal behaviour. In 1996 I teamed up with Justin Steventon, a brilliant young computer science student at the University of Cape Town. The CyberTracker user interface was developed with the help of Karel Benadie, a tracker working in the Karoo National Park in South Africa. Together with fellow ranger and tracker James Minye, they tracked the highly endangered Black Rhino, recording their movements and behaviour in minute detail. Together we published a paper on rhino feeding behaviour in the journal Pachyderm. This is perhaps the first paper based on data gathered independently by two non-literate trackers, confirming a hypothesis about rhino feeding behaviour put forward by the trackers. It was a demonstration that non-literate trackers can do science. In 2008 the Western Kgalagadi Conservation Corridor Project was initiated, funded by Conservation International for a three-year period. Community members from several villages were employed to use the CyberTracker to conduct track counts. This was the first time that !Nate and Karoha were employed in a major research project, enabling them to use their traditional tracking skills, using the CyberTracker, in a modern context. Involving scientists and local communities in key areas of biodiversity, CyberTracker combines indigenous knowledge with state-of-the-art computer and satellite technology. From its origins with the Kalahari Bushmen, CyberTracker projects have been initiated to monitor gorillas in the Congo, butterflies in Switzerland, the Sumatran rhino in Borneo, jaguars in Costa Rica, birds in the Amazon, wild horses in Mongolia, dolphins in California, marine turtles in the Pacific and whales in Antarctica. CyberTracker is being used by indigenous communities, in national parks, scientific research, citizen science, environmental education, forestry, farming, social surveys, health surveys, crime prevention and disaster relief. The CyberTracker story is captured in the powerful image of Karoha holding the CyberTracker, with his hunting bag slung over his shoulder. 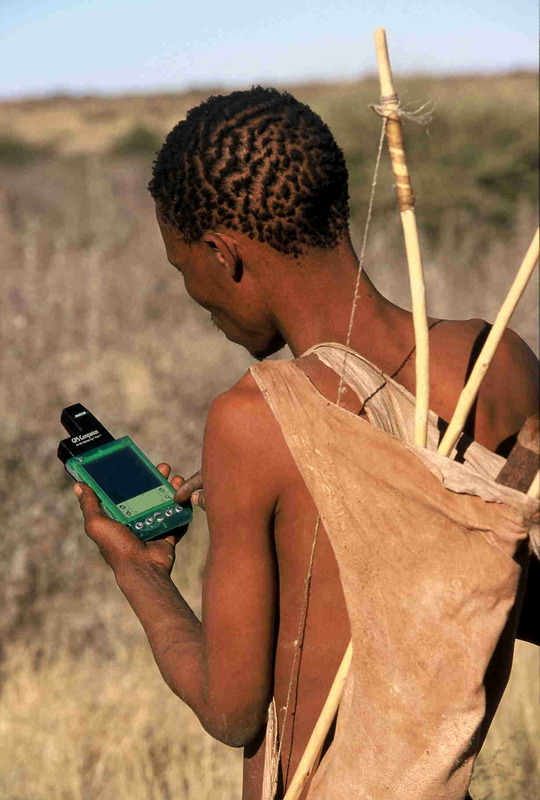 The image symbolises the cultural transition from hunter-gatherer to the modern computer age. Persistence hunting may be the most ancient form of hunting, possibly going back two million years, long before the invention of the bow-and-arrow or the domestication of dogs. After two million years, Karoha may well be the last hunter who has been doing the persistence hunt. Yet of all the hunters at Kagcae, Karoha is the most proficient in using the CyberTracker. In Karoha, one individual not only represents one of the most ancient human traditions, but also the future of tracking with computers. Karoha’s story represents the most profound cultural leap – a story that gives hope for the future: The ancient art of tracking can be revitalized and developed into a new science to monitor the impact of climate change on biodiversity. At a more fundamental level, it shows us that anyone, regardless of their level of education, whether or not they can read or write, regardless of their cultural background, can make a contribution to science. This entry was posted in 1 Tracking Science, 2 CyberTracker Software, 3 The Origin of Science, 4 The Art of Tracking, 4.1 Persistence Hunting, 6 Conservation and tagged 3.1 Scientific Reasoning, 4 The Art of Tracking, BBC, biodiversity, Bushmen, citizen science, CyberTracker, David Attenborough, disaster relief, education, evolution of human mind, farming, forestry, gorilla, handheld computer, hunter-gatherers, indigenous communities, indigenous knowledge, Justin Steventon, Kalahari, Karoha, Louis Liebenberg, master tracker, national parks, origin of science, persistence hunting, rhino, scientific research, smartphone, social surveys, software, tracker evaluation on 2014/01/04 by Louis Liebenberg.